Part of Court to Cafe in the Anschutz Gallery at the Denver Art Museum, one of three installations within the Passport to Paris trio of exhibits on display at the Denver Art Museum through Feb. 9. DENVER — Like restarting your laptop after it’s gone wonky, sometimes a few nights away from home is all it takes to relieve our admittedly First World stress. Two nights in a comfy bed and a pair of blackout curtains to let you sleep late and everything just seems to flow more smoothly. Such was the case with a recent weekend trip to Denver. After work on a Friday night in November, my husband and I hopped in the car and headed east. With a baby on the way, and our days of being selfish nearly in the rearview, we’re trying to take advantage of as many date nights as we can, and we’d been looking forward to a weekend away together. The agenda was pretty minimal: sleep in, check out the Passport to Paris exhibit at the Denver Art Museum and search out some good ethnic food. It was also the last weekend The Book of Mormon was showing at the The Buell Theatre, so we figured we’d take our chances at trying to score $25 seats with the lottery that takes place a few hours before the show. In the end, we achieved three of our four goals, which in my book is a definite win. Initially it was the lure of the new exhibit, Passport to Paris, that prompted me to book a weekend away. Really a trio of exhibits in one — including Court to Cafe: Three Centuries of French Masterworks from the Wadsworth Atheneum; Nature as Muse: Impressionist Landscapes from the Frederic C. Hamilton Collection and the Denver Art Museum; and Drawing Room: An Intimate Look at French Drawings from the Esmond Bradley Martin Collection — the collection explores French art from the 1600s to 1900s. I admit, it was the big names that drew me in: Monet, Degas, Cezanne and Van Gogh. And not surprising, it was the impressionist landscapes in the Nature as Muse section that really spoke to me. Maybe it was the below-freezing temperatures outside that weekend, but Monet’s seaside scenes really drew me in. That section of the exhibit features 36 artworks from the private collection of Frederic C. Hamilton and the museum’s own holdings. 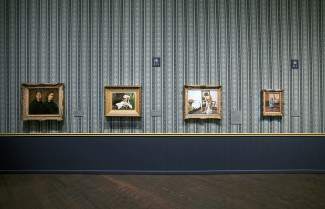 It’s the first time the masterworks have been on view to the public. You can see them through Feb. 9. And to make it more convenient, during the holidays, the exhibit has expanded hours. After spending a few hours wandering through the three exhibits on a Saturday morning, we stepped into Palettes, the Kevin Taylor restaurant located inside the museum, for a leisurely lunch. The restaurant comes up with a special prix fixe menu (three courses for $28) for each major exhibit the museum hosts. It was clear chef Austin Cueto let the artwork inspire him when it came time to design the menu: each creative plate looked like a small piece of art. The highlights from our meal were the tender seared diver scallops with cauliflower and crab raviolis, asparagus, chanterelle mushrooms and blood orange sections in a shellfish veloute and the decadent dessert. I’m a sucker for anything caramel, so the green apple tatin with calvados caramel and cider ice cream was the perfect ending to a romantic lunch. After walking the 16th Street Mall and ducking into a few stores, we headed back to the Four Seasons, our swank accommodations for the weekend. The hotel is an easy walk from the museum, the mall and a slew of fantastic restaurants on Larimer Square, including two of our favorites, both of which are chef Jennifer Jasinski spots: Rioja and Euclid Hall (where, interestingly enough, later in the weekend we sat next to Governor Hickenlooper and two of his friends during a late-night meal). The hotel is one of many who partnered with the Denver art museum to offer a special Passport to Paris package to lure visitors. It’s convenient location meant that once we valeted the car, we didn’t get it out again until we left downtown. Instead, we walked everywhere, which, despite the cold, was much easier considering parking can be a bit of a nightmare (both expensive and hard to find) downtown on the weekends. Back in the room, we sipped cups of tea (there was a sweet in-room Nespresso machine, which is always my favorite perk in any hotel) and relaxed for an hour or so before braving the close-to-zero temps again, this time hoping to nab tickets for the closing night of The Book of Mormon. Each night before the show, you could enter a lottery for $25 front row seats. A steal, for sure, especially considering the show broke house records each week the last month it was in town, and holds the all-time record at The Buell Theatre for the highest weekly gross when it pulled in a whooping $1,993,690. It’s a popular show, to say the least. Nearly 100 people showed up for the lottery and only 24 tickets were given out, which means 12 names were called. Ours wasn’t one of them, but that didn’t sour our mood any, especially considering we’d just gotten word the musical will return to the Ellie Caulkins Opera House in 2015 (Aug. 11-Sept. 13; more information at http://www.bookofmormonthe musical.com) and we can try to catch a show then. Instead we headed straight for ChoLon Bistro, an Asian fusion restaurant on Blake Street named after the largest Chinese-influenced market in Saigon, Vietnam. The popular and much-lauded restaurant is owned by chef Lon Symensma who competed at the swine-centric Cochon 555 event held at the Four Seasons in Vail in March. We made it just in time to enjoy the restaurants happy hour specials on food and drinks, which last until 6 p.m. We scored the last two seats at the bar and tucked into a few appetizers and a stellar sweet-and-salty Brussels sprouts dish with ground pork and crispy fried mint that will convert even the most vocal Brussels sprout hater. But first, we started with the steaming hot (seriously, you have to be careful) signature soup dumplings filled with a lovely combination of gruyere cheese and sweet onions, followed by the pork potstickers with an over-the-top-good ginger mustard and finally the most interesting dish of the night: the Kaya toast with coconut jam and egg “cloud,” which the bartender assured us was outstanding. And it was. For something so simple — essentially pieces of toast with jam you dip into a super light egg custard — it was really impressive, hitting so many texture and flavor profiles at once: sweet, savory, creamy, crunchy and downright addicting. With full bellies and warmed feet, we left the restaurant and decided to get lost in one of my favorite Denver haunts, The Tattered Cover bookstore. All in all, it was a rather tame Saturday night but it very squarely punched our reset button.